I don’t know about you guys, but school day breakfasts at our house have always been like WOAH. From back in the day when I was a teacher trying to hustle my little one off to daycare, to now as a SAHM trying to hustle my big one off to class, the name of the game has always been to get everyone fed as quickly- and as free of chaos!- as possible. Here, you’ll find our ten favorite recipes and quick breakfast ideas for kids to make eating breakfast go down a little easier. This post contains affiliate links. You can read more about our disclosures and policies here. Thank you! One of the easiest ways to get a little calcium and protein into my kids is to take those little yogurt tubes you find in the grocery store- think GoGurt or Chobani Kids- and freeze them. Once they’re solid, I take the tube and cut it in half, making two little “yogurt popsicles,” and hand them off to my toddler. The shorter size makes it easier for him to get all the yogurt out himself. And because they’re frozen, he doesn’t make anywhere near the mess he would with a fridge-temperature tube. Can’t get on board with the sugar in GoGurt? Or prefer to make your own for budgeting purposes? Buy these little tubes on Amazon and make them yourself using the yogurt, smoothie, or puree of your choice! There are lots of overnight oat recipes out there, but we are partial to the Red Velvet version from The Peachee Pear- which even includes a sneaky veggie! You can make several at once, and have a little sweet treat ready for breakfast when you wake up in the morning. My daughter hates eggs. Or so she says. But egg-and-bacon breakfast burritos? THOSE she loves. Scramble some eggs, place them in a tortilla, and crumble some bacon on top. Add a little cheese, roll it up in a heated tortilla (microwave for 20 seconds will work just fine), and you’ve got a breakfast packed with protein and yumminess. As an added bonus, these freeze really well. 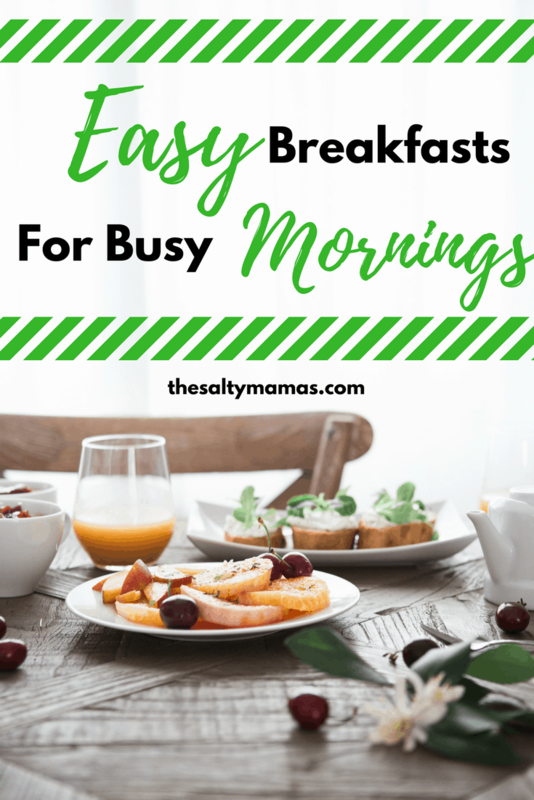 I make a big batch, freeze them in Ziploc bags, and reheat one at a time for a quick breakfast when we’re in a rush. 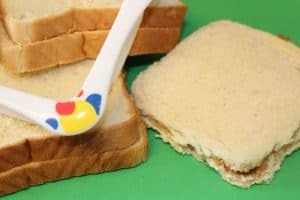 These two-ingredient wonders were a staple in the breakfasts I would pack for Lila’s daycare lunches as an infant and young toddler. Take one mashed bananas and mix with two eggs. 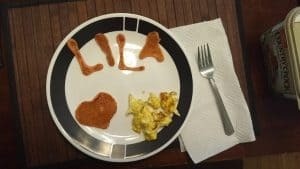 (Our friend Catherine adds a little food coloring to make mornings extra fun!) Cook on medium in a greased pan, like you would a pancake, for two or three minutes on each side. These also freeze really well, stacked in a Ziploc bag. Take them out the night before and they’ll be thawed by morning, or reheat in the microwave for about twenty seconds. I serve them plain, but if you’re not as sticky-averse as I am (seriously. I can’t even. ), then feel free to add some syrup or jam. Pancakes freeze like a DREAM. Use your favorite pancake recipe (our favorite comes from Grace and Good Eats– we sub in whole wheat flour for the ones we freeze for the kids), and make as normal. Stack two-high in a flat bag and freeze. You can take out a few at a time and reheat as needed. These are a little off-the-beaten-breakfast-trail, but my toddler actually gobbles them up. This Golden Sweet Zucchini Pancake recipe from Super Healthy Kids freezes really well, and is a great way to sneak some veggies into your child’s diet. I actually freeze the three kinds of pancakes listed here- one each of the zucchini pancakes, the whole wheat pancakes, and the egg-and-banana variety- together in a single-serving Ziploc bag. That way, I know I can give my little guy one bag of pancakes and have all of our bases covered. Okay, I KNOW. It’s a PB&J. But did you know some nutritionists recommend peanut butter and jellies as the perfect pre-workout meal? And what is childhood if not one big workout? It’s the perfect mix of carbs, proteins, and a little something sweet. And you can make it healthier by using real fruit preserves, whole wheat bread, and the nut butter of your choice. Make it extra fun by using these sandwich cutters from Amazon for a special school-day-morning treat that doesn’t add a lot of extra time. Looking to save time on prep? Check out our how-to video on Facebook! Our friends at How We Do have a list of delicious, healthy breakfast ideas for families on the go. Our favorite is their eggs in muffin cups, which you can modify for each member of your family and just bake once! 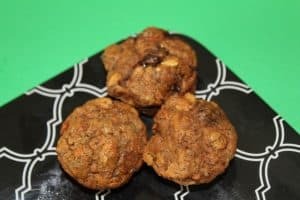 So your kids won’t eat a typical breakfast- but these breakfast cookies are anything but typical! And as an added bonus, they are easy to eat on the go for those mornings that start at full speed. Thanks to Blessed Simplicity for this awesome idea! I mean, why not? 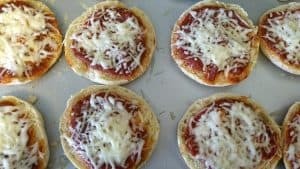 I started making my kids little “pizzas” out of whole wheat English muffins, topped with pizza sauce and some mozzarella cheese. I kept them in the freezer for quick lunches or dinners, and my kids could tear through two of them a piece. One day my daughter asked me for pizza for breakfast. My gut reaction was, “no,” because I’m a monster. And then I realized that if I served her one of THESE little pizzas, she would be eating whole grains and dairy and was like, “girl, eat your pizza.” And so a delicious breakfast tradition began! 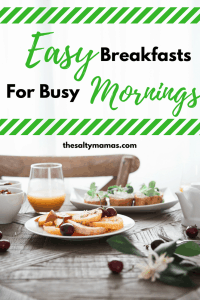 There’s our ideas for quick breakfasts for busy mornings, but we’d LOVE to hear your go-tos in the comment section! What are your kids’ favorite breakfasts? Make sure you’re following us on Pinterest, where we’re constantly uploading kids’ meal ideas. We’ve got a whole board dedicated to it! See you there! I swear to God I have considered opening a breakfast restaraunt that only serves banana pancakes , because they are that good! If I cut a GoGurt in half there would be HELL to pay. I can just hear the screaming now. My son ate 4 of them yesterday in a row. Full size. Yes I could have refused but I was like…wellllll it IS yogurt…and it kept him entertained for a good 20 minutes. Total win, right?